Sean & Patty are probably up to their ears in zucchini or are going to be very soon! These were GREAT! Even the Pelican, who hates zucchini, tossed them in, threw his head back and scarfed them down – no kidding. The best thing about it was no grease, no oil, no fat aside from the small amount of Parmesan cheese. How you ask!? Well – I used my trusty new pan which isn’t new any more because I bought it six months ago and still am in love with it. Now to part two of this post. I need your opinion. John is my go to guy on the photos and we tend to agree on which one to post. Most times I don’t even need him, but when I do he’s always handy. Lately one of us has a) advanced/soured/lost our photo taste b) has seen far too many food photographs to care anymore or c) has our head up our keaster and can’t see anything. Which photo (top of post or bottom of post) do you like better and why – ignore the carrots on the top one – I added those the second time I made these – I’m asking about overall composition. Of course I have an opinion – I just don’t want to taint yours! Shred 1 Medium sized Zucchini – I believe this is relative so make that about 3 Cups total. In the frying pan you’re going to use boil 1/4-1/2 Cup Water and dump in 1/2 Cup Shredded Carrots – blanch about 1 minute. Drain and put in spinner. Spin, Spin, Spin all the excess water off. If you don’t have a spinner use a colander, then place in a clean kitchen towel or paper towels and squeeze out the juices. Mix it all together then fry them up over medium to high heat. About 3 minutes on each side or until lightly browned. Sorry to say, if you don’t have the lovely T-Fal pan – you will have to use some oil. Like the top picture, something about the stark background appeals to my eye. I like the top photo for it’s color. But I like the bottom because it’s grounded with a plate. The top looks like two piles of stuff floating in space. But the bottom looks oversharpened in Photoshop. I love the bottom photograph! It’s so much more artistic to see the food set off by the rich rust of the plate. I don’t like the “floating” effect of the top one. My zucchini have flowers on the vines …….however, they’ll probably have a set-back as I moved them to a sunnier part of the garden just this evening! As soon as they come in you can be sure I’ll be trying this recipe. You can never have enough zucchini recipes! Yum, Emma and Wanda made these tonight as I sat in my recliner with my bum leg elevated kibitzing. Really good! I added the sriracha after cooking as they don’t care for the heat. Tasty stuff! Yum, we made these tonight they were SOOOO good!! I never thought they would be so good!!! I like the top one, but I have trouble ignoring the carrots because I think it adds color. These sound so good! Ive got to try them! I reckon even my son would eat them! Saving this recipe! Top photo. Be honest however, I’m attracted to the post by its title saying ‘without oil’ because my preference, whenever possible, is to have a healthier way of cooking. Thanks. This sounds great, and I can’t wait to try it!! In fact, I have a zucchini waiting in the refrigerator, and this will likely be its destiny. And I like the top pic because you can see the ingredients better (particularly the carrots). I vote for the top photo…like the color and feel like the texture pops a bit more. p.s. 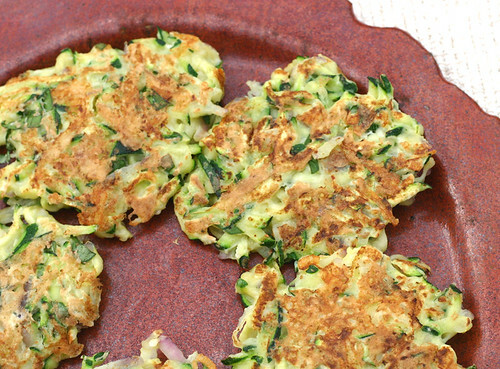 the zucchini cakes sound light and delicious. 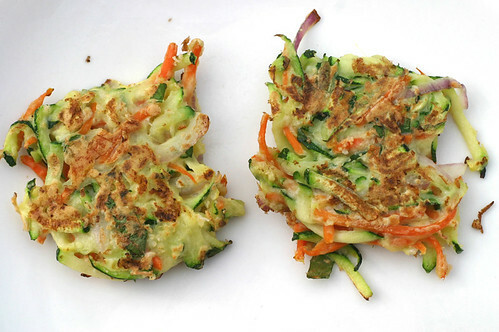 I do have zucchini coming out of my ears…I add zucchini to everything…Can’t wait to try this. Top Photo caught my eye first! You need the texture of the top cakes displayed on the rust plate. I think the color of the cakes is too bland, and doesn’t have enough contrast with the white plate (thus the floating effect), but the texture of the cakes in the top photo is better than the texture of the cakes in the bottom photo. Top photo, without a doubt. I can see what’s in the cakes, and the dark item against the white background it awesome. I prefer the white background of the top photo b/c it makes the colors in the zucchini cakes stand out. However, I would prefer to see a different arrangement of the zucchini cakes (e.g., overlapping) and probably 3 cakes (things always look better in odd numbers). These look delicious. And I agree with pat. I don’t like the “floating effect” of the first photo and the white background just feels like negative space. Second photo! I prefer the top shot. Simple and to the point. We are all about minimalistic nowadays anyway. Colorful and they look yummy. How many ppl will this serve? It yeilds about 3 1/2 cups of batter. One medium zucchini isn’t a whole lot. Sean said he made nine cakes. As a side dish I think 3 people. As a main dish just two people that will be very hungry in an hour. I was gonna make this for tomorrow’s pot-luck party for 9 ppl. Sean made nine cakes.. LOL.. I guess tomorrow everyone will only allow to have one cake each as an appetizer. Maybe I will add some hash browns in as well. Potato will goes well with Zucchini? I was also thinking making some creamy sauce to go with it. Maybe Tzatziki or caesar dressing? I don’t think these would hold up well for a potluck. But I wish you luck – let me know how it turns out. The potluck was great. I fed my guest with this dish as appetizer (each person only gets one cake :P). They like it, no complain. But I might not have dry the carrot enough and the batter was a little watery thus the cake was somewhat soft and couldn’t be picked up with a tong. But taste-wise, it was good. I wouldn’t change the recipe at all. I wonder if I could spread them out on a cookie sheet and bake them for 15-20 mins next time. I think that might be another good way to cook them without oil. I substituted Parmesan with Cheddar (only had that in my fridge). I wonder if Parmesan cheese would taste a lot better? Glad it worked out for you – I think baking would work too and I would add some salt if not using Parm. First photo for sure. These look scrumptious! I think I could stand in the kitchen and eat one out of every batch made. When you stand in the kitchen and eat, it’s free calories, right? We made these again last night and even Gannon ate them and Gannon doesn’t eat anything!!! !